The buzzing roar of motors mingles with the odor of fuel and fresh cut wood as a parade of forms slowly emerge from rough hewn logs – it’s Carving in the Ozarks 2014! 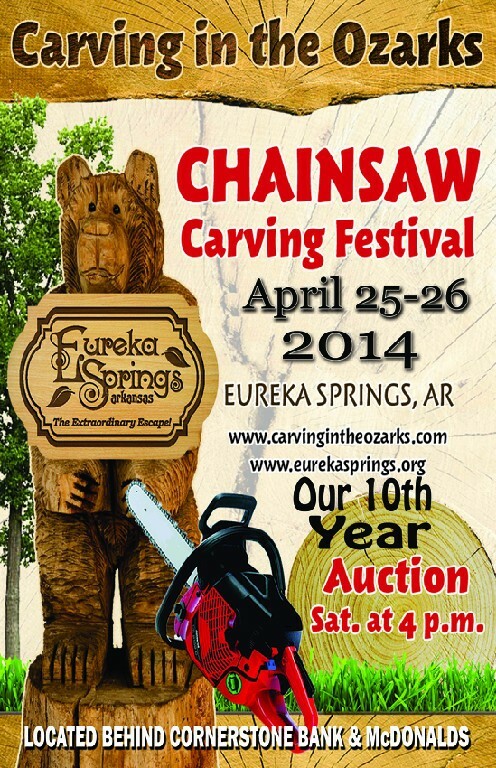 Carving in the Ozarks 2014 is a premier, chainsaw carving event held every year in Eureka Springs, AR. Now in its tenth year, this two-day festival attracts chainsaw carving artisans and enthusiasts from around the US, ready to compete against and be treated to a number of amazing artists displaying their singular talents. Watch as these talented masters of the chainsaw pull beautiful forms from otherwise average logs and stumps – and we’re not talking about just a bunch of bears and pseudo totem poles, either. You will be witnessing true artists at work at their craft and the masterpieces they create will amaze and delight you in ways you didn’t think chainsaw art could. You will never look at a chainsaw the same way again. On average, the event attracts between 20 to 25 chainsaw carving artists, each ready to participate in the two carving events of the weekend. The first on Friday and the second on Saturday, both starting at 8am. All sculptures created at Carving in the Ozarks 2014 will be auctioned off on Saturday afternoon at 4pm, with a portion of the proceeds to be divided among local charities. Registered bidders will also be entered into a drawing to win one of the chainsaw carvings for free after the auction. Eureka Springs is a great place to visit all year ’round but you could pick a worse time than spring and a festival of artistic craftsmanship for a good cause. 5 Ojo Inn Bed & Breakfast has 9 rooms between two historic homes and two cottages in the historic district of Eureka Springs and every guest enjoys an elegant, three-course breakfast each morning. Let us be your home away from home while you’re in the area. It’ll make your stay, we guarantee it.